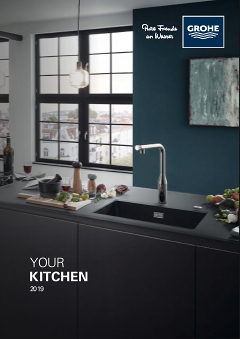 GROHE K7 brings an exciting new level of design and performance to your kitchen. Developed in cooperation with professional chefs to incorporate a multitude of convenient features, this mixer comes in a stainless steel look with our mat GROHE SuperSteel finish that makes it extra resistant to scratches. One of its special features is a pull-down comfort spray head that offers a choice of two spray types – a fine spray jet and a powerful shower jet – so cleaning your sink area has never been so quick and effortless. Its high spout is ideal for filling large pots and it even swivels smoothly through 140°. Thanks to our GROHE SilkMove technology, water volume and temperature control is smooth and precise. GROHE K7 – maximum convenience for your kitchen!